Happy May! Can you believe it? 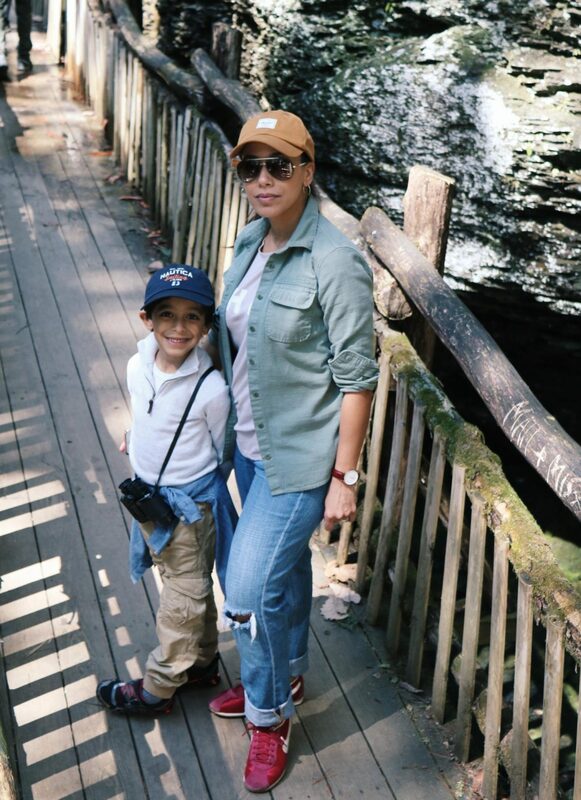 Summer is almost here, and I’m taking advantage of the warm and sunny weekends to take a few day trips with my family – our most recent being to Bushkill Falls, PA. Mr. E and I got married outdoors, under a tent and near a barn with mountain views, so it’s no surprise one of our favorite ways to spend a weekend is a day trip with our son hiking up to a waterfall! If you’ve been following my Instastories, you know we’ve even been looking into purchasing an RV since we enjoy camping and the outdoors so much! We love to travel; just look at some of our favorite places we’ve been – Greece, Montreal, Cape Cod (here, here and here), Hawaii, Walt Disney World, and Argentina! 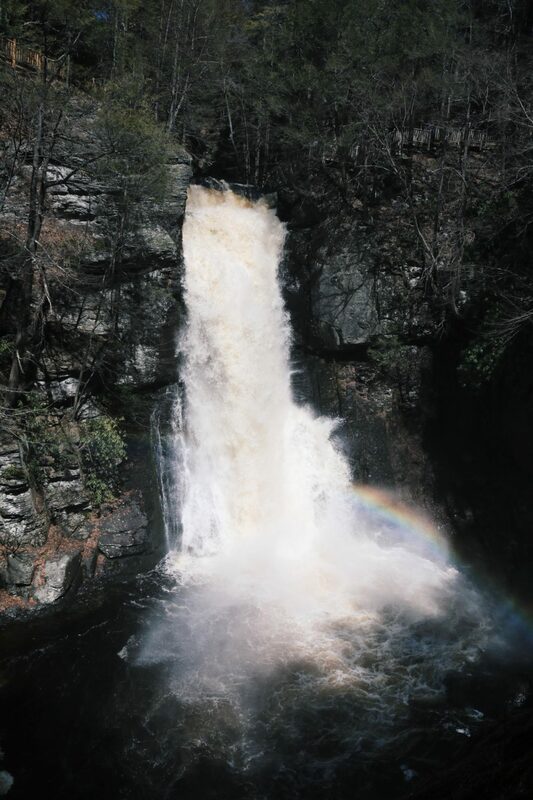 I’ve known of Bushkill Falls located in the Pocono Mountains in Pennsylvania since we visited several others in the area, but last week was my first time visiting the falls. Let me just say that I’ve been to Niagra Falls, and now I know why they call Bushkill Falls the Niagra Falls of Pennsylvania! 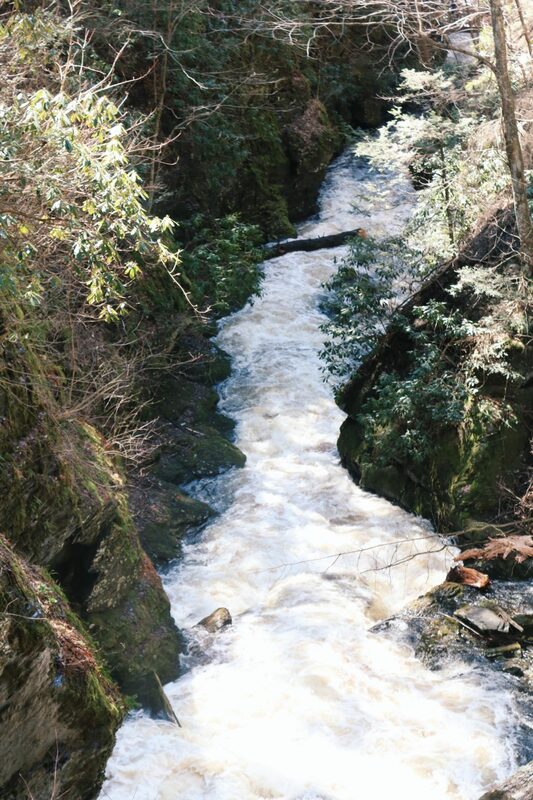 The 100foot waterfall alone is stunning to see! 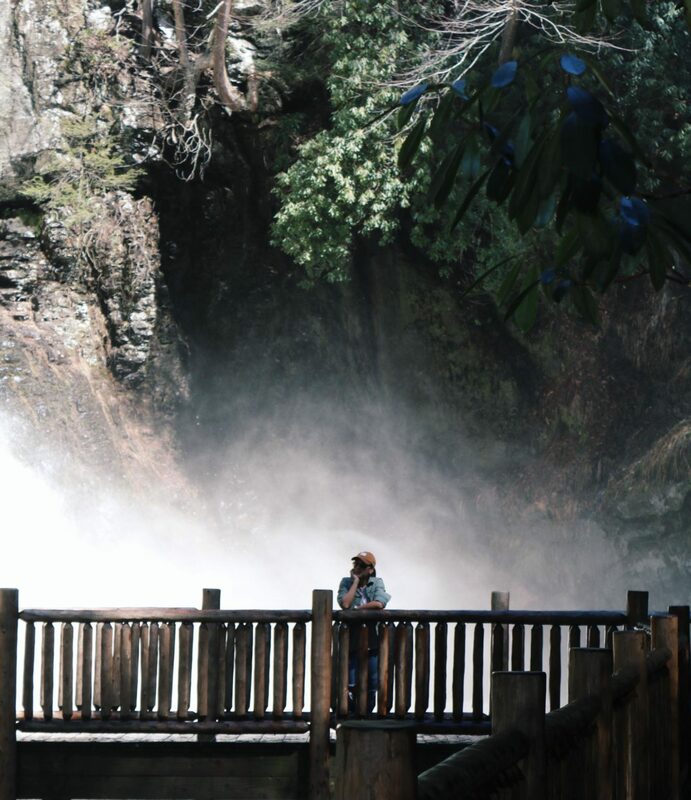 You can get up close and actually feel the cool mist of the water splashing down as it rapidly descends from above while you walk along a wooden path and bridge. There are different trails (green yellow, blue, red) you can hike depending on how much time you wish to spend there. The Green trail being the easiest with only a few steps but no climbing while the red trail is the most challenging at 2.5 miles long with several steps to climb and over 2 hours to hike. Overall, it’s important to remember you are hiking about 1200 feet above sea level, so before going it’s good to know what to wear and bring. 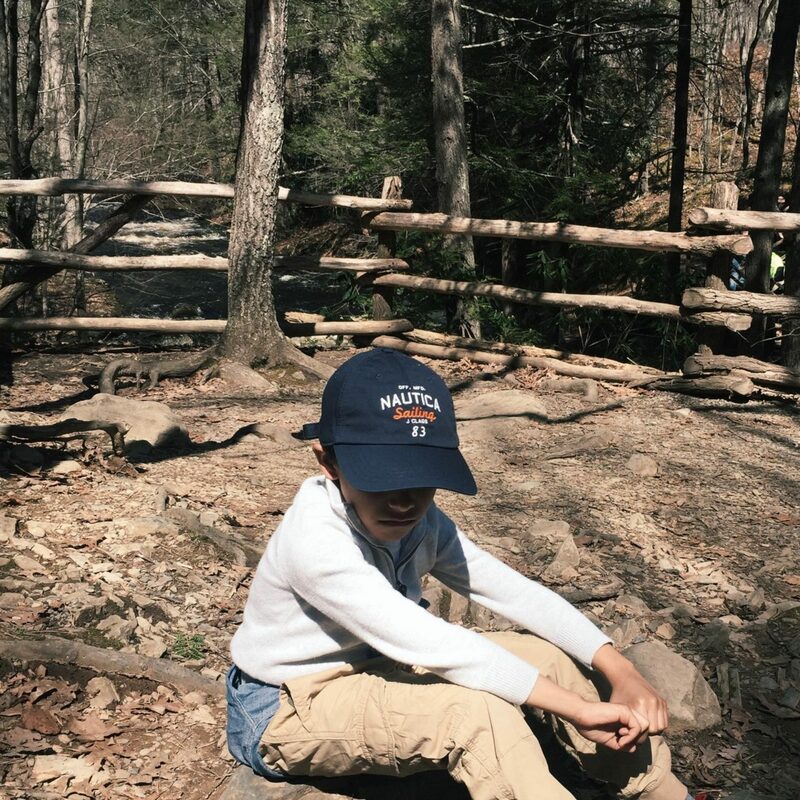 I saw all people of all ages hiking, so it’s really about how you come ready for the hike. A plus? There are places to rest along the way – granted it may be on a large rock! And don’t be surprised if you see a creature or two along the way! I forgot my water bottle in the car, which totally was not smart! But I was able to purchase one at the food store they have on site. 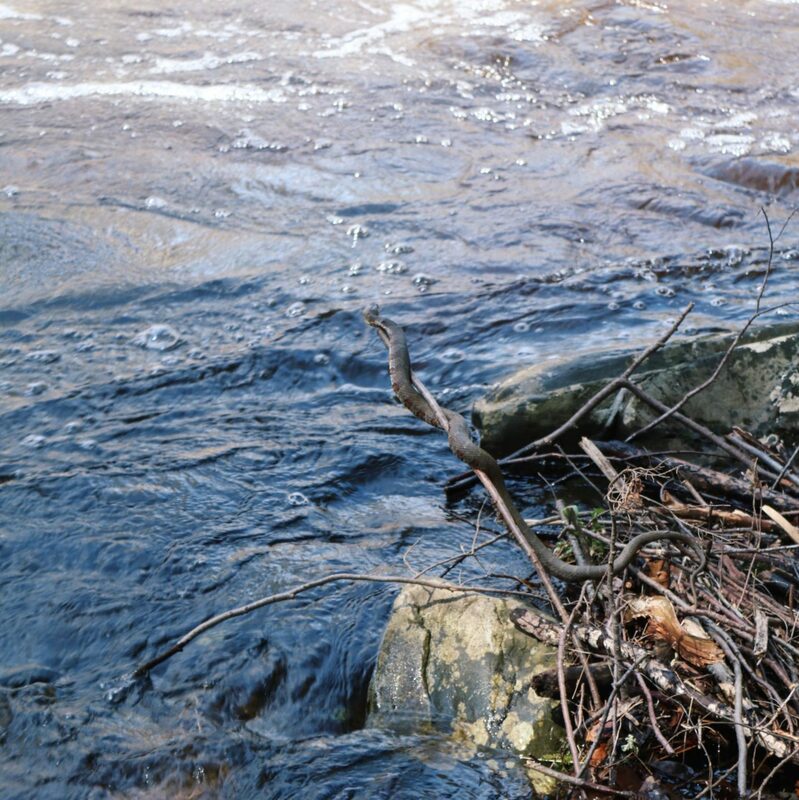 Here are a few good ones that can keep your drink cool for the long hike! You are not going to want to miss out on all the beautiful places to capture on camera! So be sure to have it fully charged before you head out the door! Now whether you use your heavy duty camera or just your phone, make sure to have a battery backup! With all the IG stories or snapchatting you’ll want to do, having a small backup charger will be a must! Some of my faves are lightweight and give you plenty of power to last the day! If you have kids, they’ll love to have a pair of binoculars! There is so much to see, and it’s a great way to observe some of nature through a closer lens. 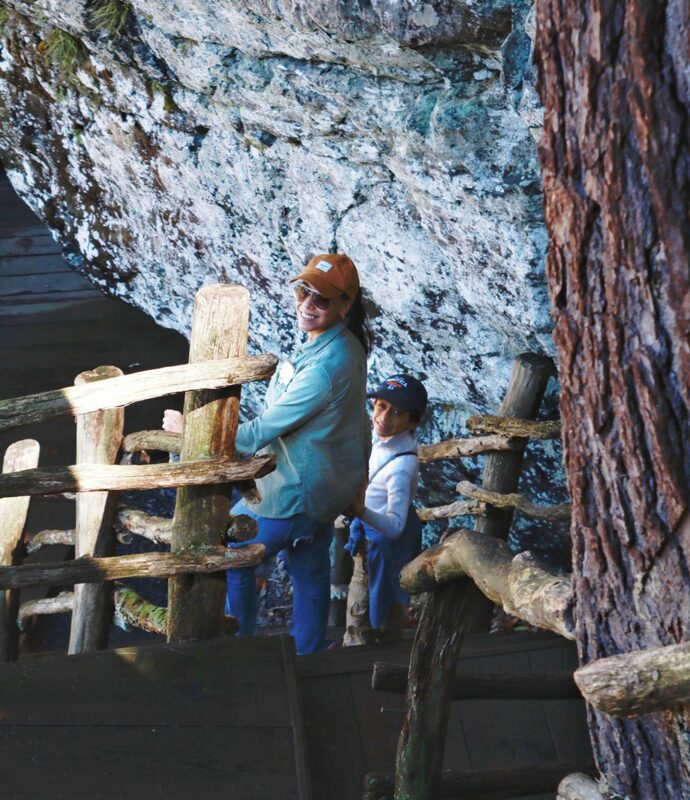 The little ones love to feel like explorers, so it’s exciting to make it part of the hiking experience! No matter the weather, I know that having options on a long hike is so important. Dress in layers, so you have the option to warm yourself up in some of the cooler parts of the hike (seasonal) and when you feel warmer because your heart rate is slowly rising! See below for outfit details in “Shop the Feature”. You can’t forget to protect your skin and your eyes! Wear sunscreen, shades and a hat! 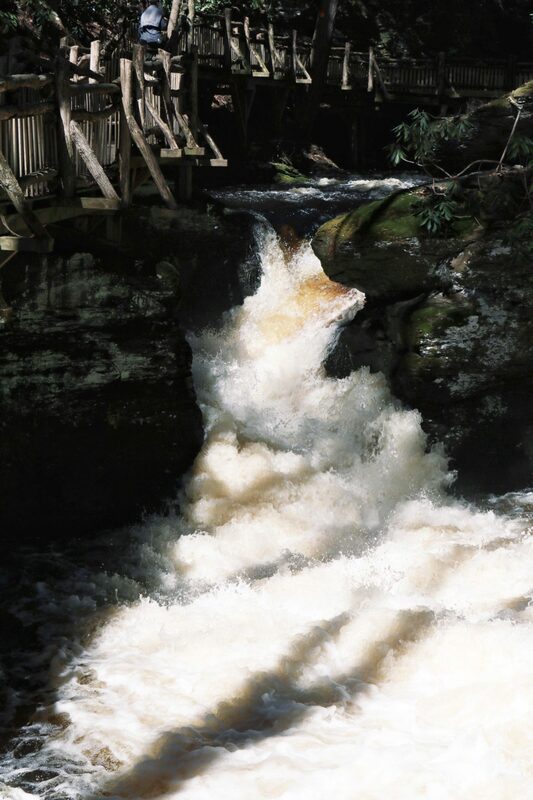 The beauty of the waterfalls only makes me more aware of how important it is to take care of what is most natural to us – and that is our skin staying hydrated and protected from the harsh sun. 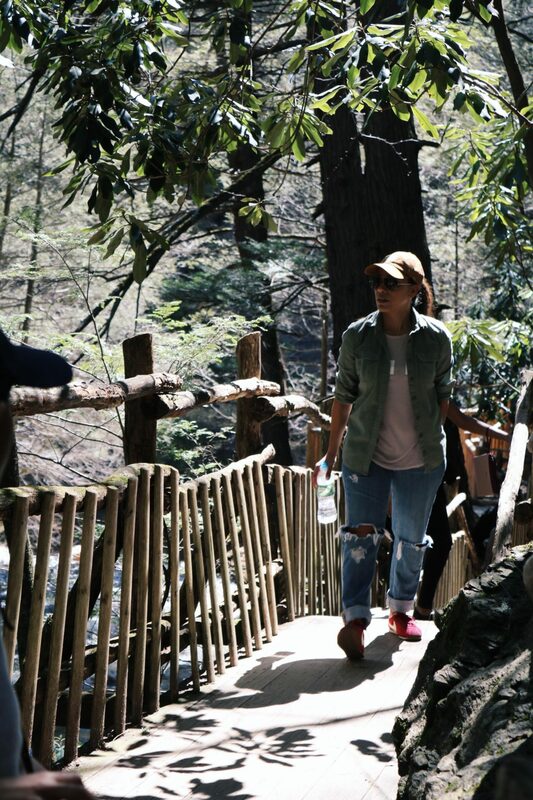 You’re going to want to wear your best version of a hiking shoe! Clearly, I could have been more prepared and worn a better pair myself, so lesson learned. A great pair with a sole that grips works. I’ve recently invested in another pair for my next visit! 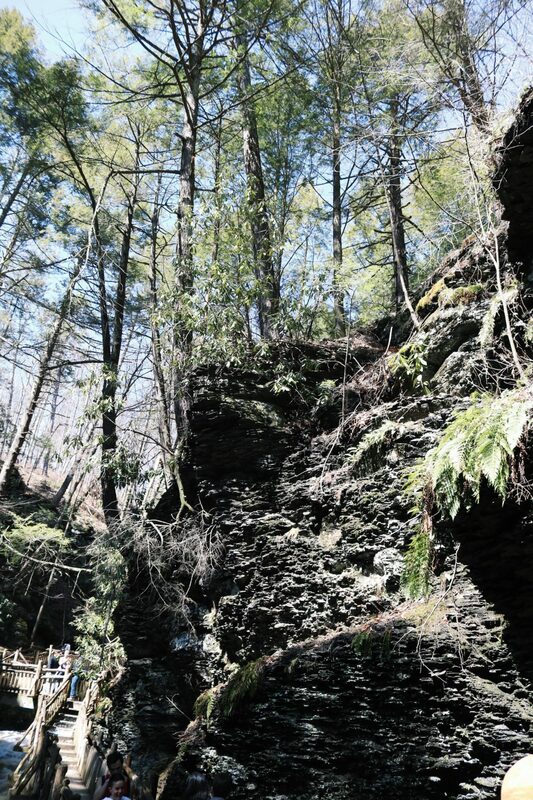 Hope you enjoyed this photo story and tips for a lovely day trip out to Bushkill Falls! We’ll be traveling again soon and can’t wait to share our next adventure! Where are you headed on your next vacation or even just next weekend? Let me know in the comments below. And if you want to see more of our travel adventures, let us know! Thank you so much for reading. 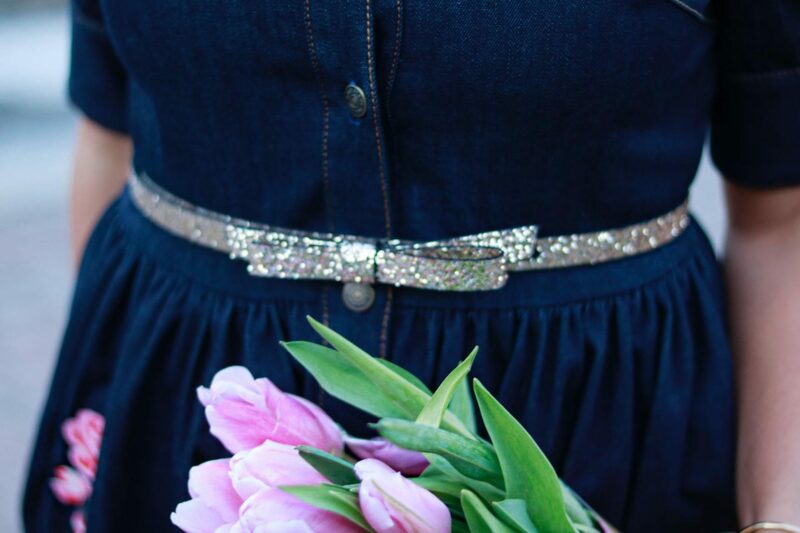 Spring is the perfect time to wear your favorite dresses, even on your more casual weekend days! I love how easy it is to throw on a maxi dress and feel ready to take on the world while feeling super comfortable for just about anything, especially as a Mom! Being petite can make it a challenge for me to find the perfect maxi dress without looking “lost” in all the fabric. Enter the tiered maxi dress! 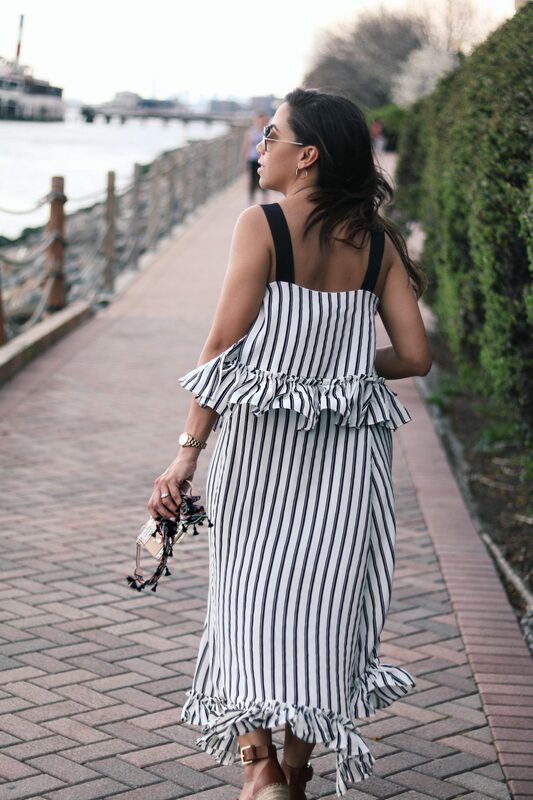 Wearing a tiered maxi gives dimension to your look and definition at your waist that you may not otherwise get with a straight long maxi dress. I personally love how fun and girly this dress feels. It goes from spring into summer easily, so on a cooler day, I could simply wear a cardigan over it. And because ruffles and a windy day make for a fun photo shoot, I thought I’d add a little joy with my new favorite phone case! I love that it keeps me hands free and is a wallet as well for my most important cards. These wedges are one of the most comfortable pair of shoes I’ve ever owned, and they come in so many colors! As a girl who loves wearing heels, wedges are perfect way to get the height I want and the comfort I need. Hope you enjoyed this post! I enjoyed shooting it and sharing my love for maxi dresses for spring! What is your favorite style for the spring season – dresses, shorts, a simple t-shirt and jeans? I’d love to know in the comments below! Thank you for stopping by! It’s the weekend (whew!). This past month has been a bit of a struggle for me. I can’t tell if the stars aren’t aligned as usual or I’m just in a funk, but I know I’m doing my best to get back to my best self. How has your month been? Hopefully great! 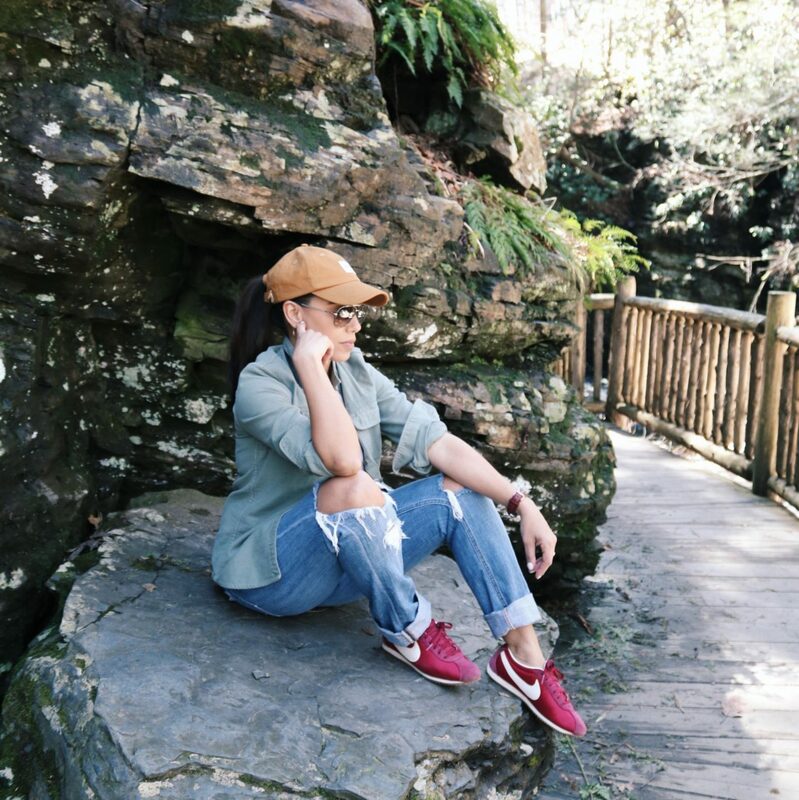 One of the best ways I step out of any funk is to enjoy the good weather days as they come and embrace the change in the seasons with my style. If there is one thing I have learned well, it is that when things in life feel too big or overwhelming, making time to organize some thing as simple as your closet can go a long way (in comes spring cleaning!). Styling an outfit and getting dressed is my way of facing the day when it all seems uphill. 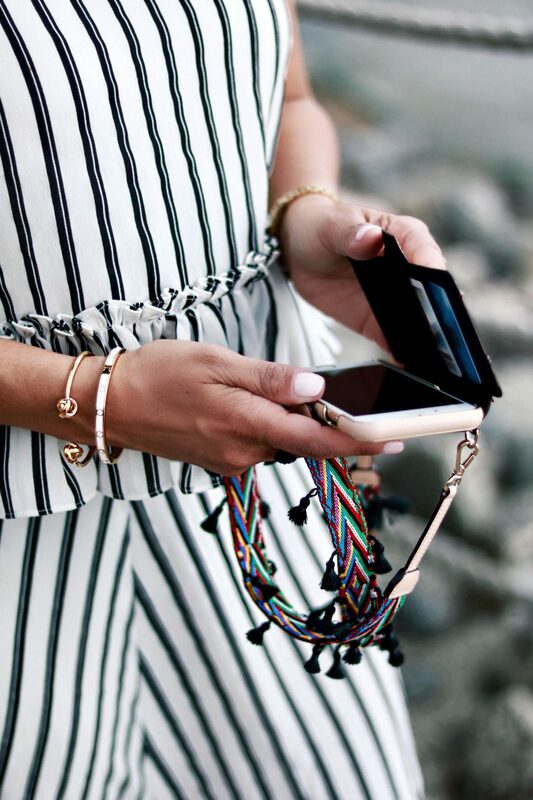 Taking a moment to go through those favorite wardrobe pieces and restyling them a new way for a different season can very well give you just the motivational boost you need for the week! 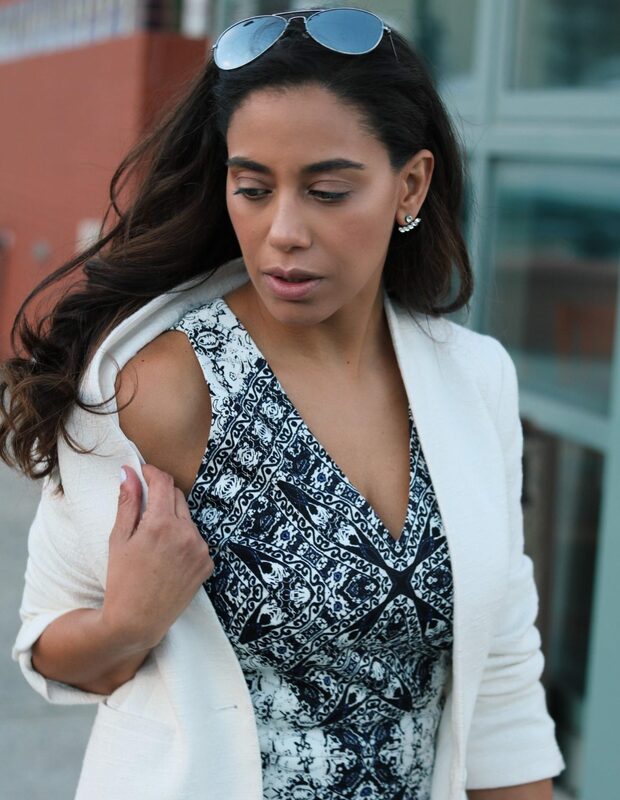 I love a white blazer for spring (And, yes -white before Memorial Day is absolutely acceptable! I follow the rule that there are no rules in fashion! Wear what you love and makes you feel great.). It makes for the perfect canvas to add a great printed piece, like this Maggy London dress. 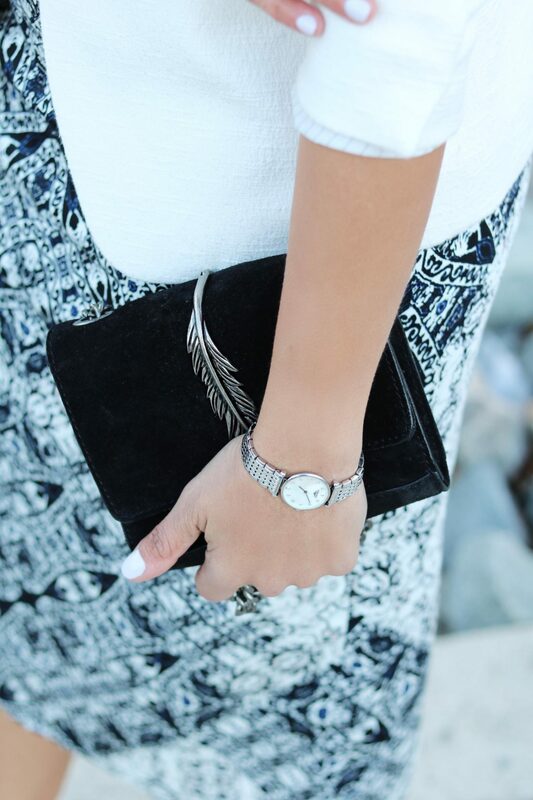 I happen to love the sleek look of pairing prints with white because it draws the attention to the print itself. What makes this print stand out are the subtle touches of blue and black that give you a range of colors to pair with the dress, making it versatile for your style at work or an evening out after work. I liked keeping the palette smile with black and silver, the perfect spring style for work. I don’t always wear print because it can be a challenge for me to find the right harmonious color to wear it with, but you can always count of a great white or black piece to carry you through those wardrobe conundrums. Do you like prints or do you prefer to blocks of color for your work style? Let me know in the comments below! And if you like this post, please consider sharing it or pinning an image by hovering over your favorite pic to pin it! Have a wonderful weekend! Thank you to Maggy London for partnering on this post! Happy Sunday! If there is one neutral I am drawn to most, it is gold! It’s pretty obvious, I know. But more than a color (can we call it that?) that makes me always think of my daughter’s room, it’s also a classic base for any style you put together that gives you a little “wow” factor on your most causal days. The metallic shoe trend is ever so alive. But aside from trending these days, it’s safe to say there will always be a great metallic shoe you can wear from your causal days to the fanciest of events. Remember these silver oxfords from a while back (or these from 2 years ago!)? I wore them out for almost an entire season until I found the perfect gold pair in these flatforms. They give me height so that I can wear them out to run around shopping and still have some edge to my look on my more casual days. In other words, I feel dressed up when I really may not be. Ha! 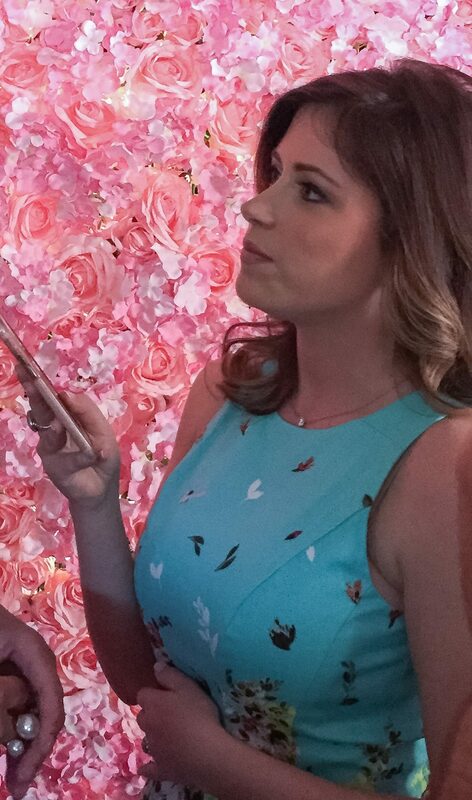 I happen to also be loving floral print right now! It’s all over Instagram, but I have to say it wasn’t originally a print I was drawn to. It can a challenge to make floral print look grown up, but with little hints here and there in a key piece, you can pull it off! 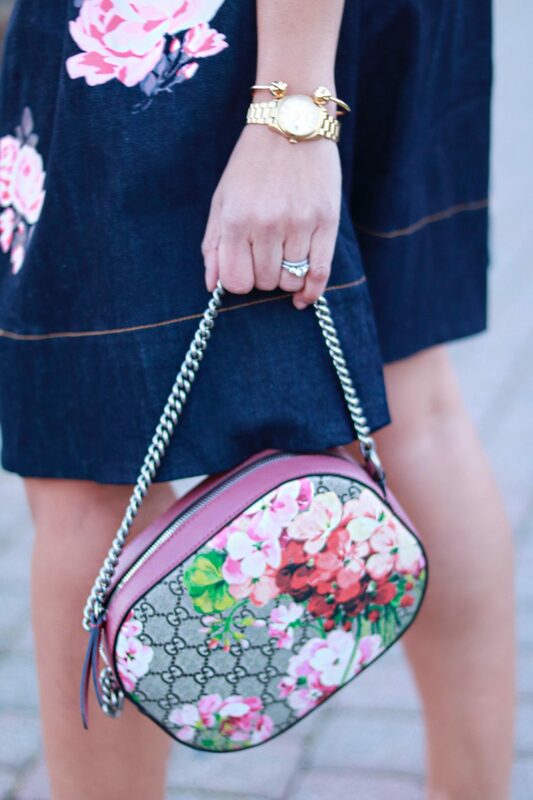 See my last post sharing this beautiful Gucci bag with a dressier look in a floral denim Kate Spade dress! While I sometimes feel that I am too petite to pull off a pair of wide leg jeans, I love that these cropped Levi’s hit right at the ankle. With only a little fringe at the bottom, the jeans feel fresh, casual, and super comfortable. I’ll wear a great pair of skinny jeans any day, but having loose-fitting jeans in your closet is a must! Are you a silver or gold shoe gal? Let me know in the comments! Love the look? We’d love for you to pin one of images and share your love with others! There is something exciting headed our way, and we ant you to be the first to know about it! Sign up here for our newsletter, and get in on all the fun! (Hint – giveaways, and takeovers!) Thank you so much for stopping by! Okay, so first things first – it’s been awhile, again! Best explained – my site and my life went under a bit of a hacking. Still learning the world of backend computing, I lost access to a few important files to get back to posting. As for my life, the early months of the year were consumed by my dedication to directing a musical. This year (my 12th! ), I directed Next to Normal, and if you don’t know the story well, let’s just say that it is an intense story about family, love and loss. I wanted to honor it well, and so I dove right in and didn’t look up until it was finished this past weekend. Now over both overwhelming experiences, I’m making my spring return (while outside my window an ice storm is reminding us winter is not quite over) and celebrating year two of This Season’s Gold! 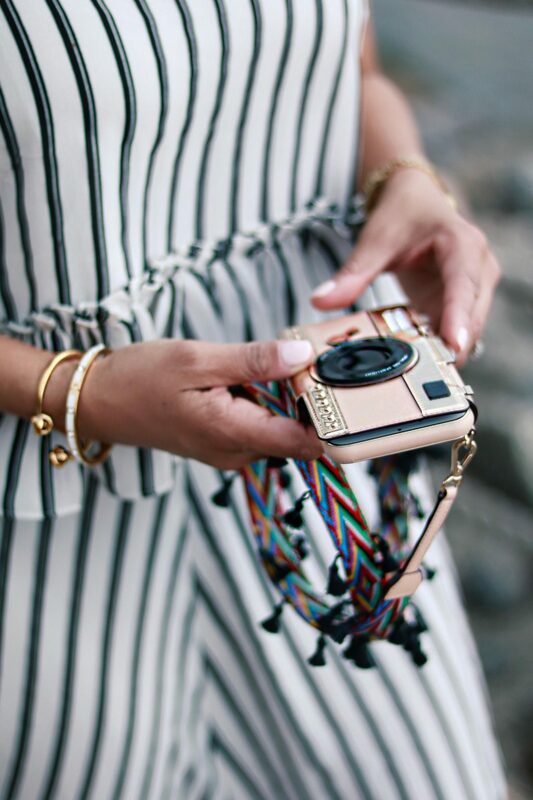 I have been sharing on my social sites in the meantime (follow along on Facebook, Instagram, and Twitter), and thrilled to have recently partnered with Kate Spade to host a Spring Style Event on April 7th! If you are in the NJ/NYC area, check out the details and rsvp here. If you haven’t noticed, flowers and denim have made their return in a big way together this season. 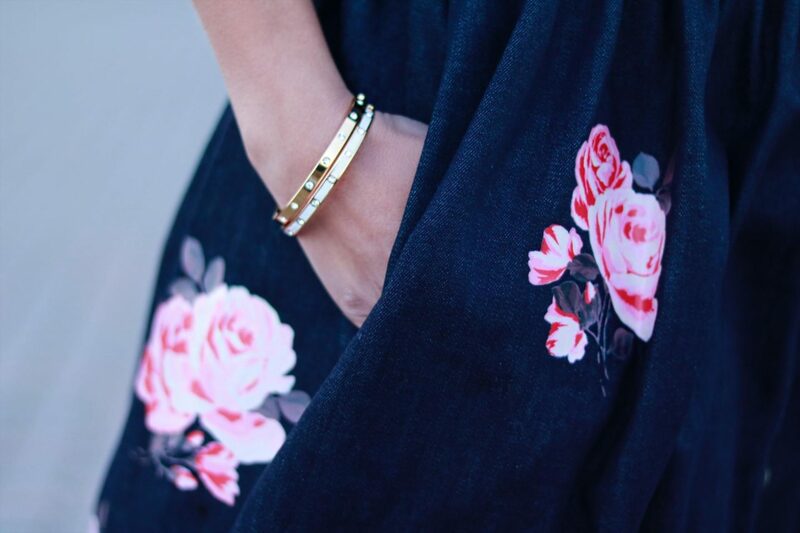 Whether you’ve seen embroidered flowers on jeans, floral patches on denim jackets, or rose appliqué’s on pretty denim dresses like this one, flowers have returned for spring quite fashionably this season! This denim dress (with pockets!) is perfect for the transitioning season. 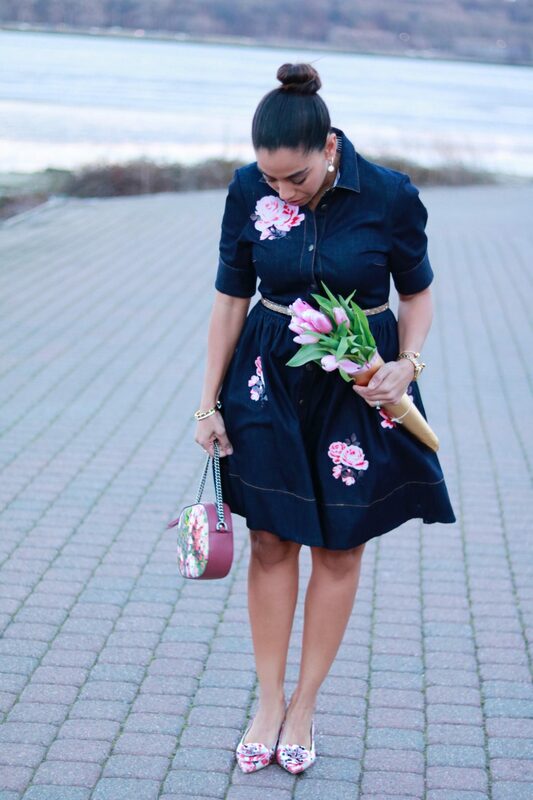 I love how structured it feels and that the dark denim makes the pink flowers pop with color. 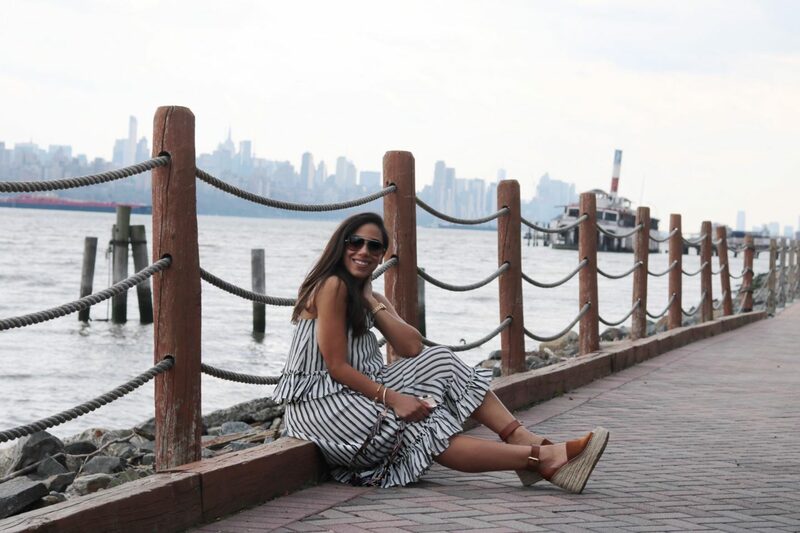 With a black and white striped inner collar detail, this dress makes for a perfect outfit for a stroll in Paris or a spring evening in New York along the water. 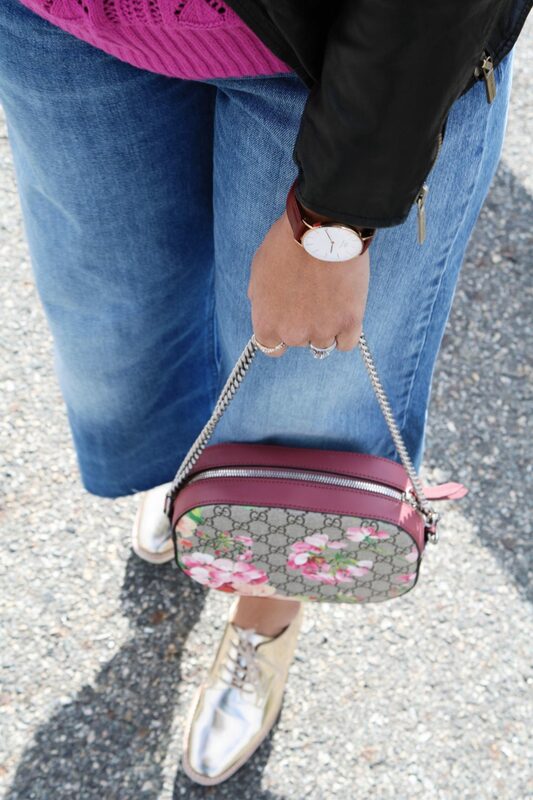 Adding my new favorite floral bag and low block heels, I am ready for spring! I couldn’t resist a few touches of gold from my belt to my bracelets. I was happy to add a little sparkle to celebrate This Season’s Gold second anniversary and all that is to come our way this year! I’ve added some of my favorite flower and denim looks below. What are you looking forward to this spring? Let me know in the comments! Thank you so much for all the love you have given me and This Season’s Gold this past year! We have grown so much, and I cannot thank you enough for making it possible. I hope to surprise you with so much more content this year! Thank you for stopping by! 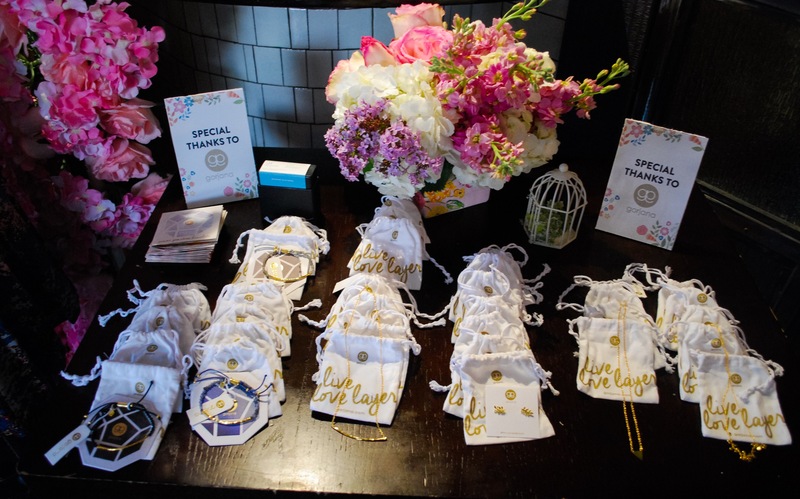 Thank you to Kate Spade for partnering on this post. Happy June! 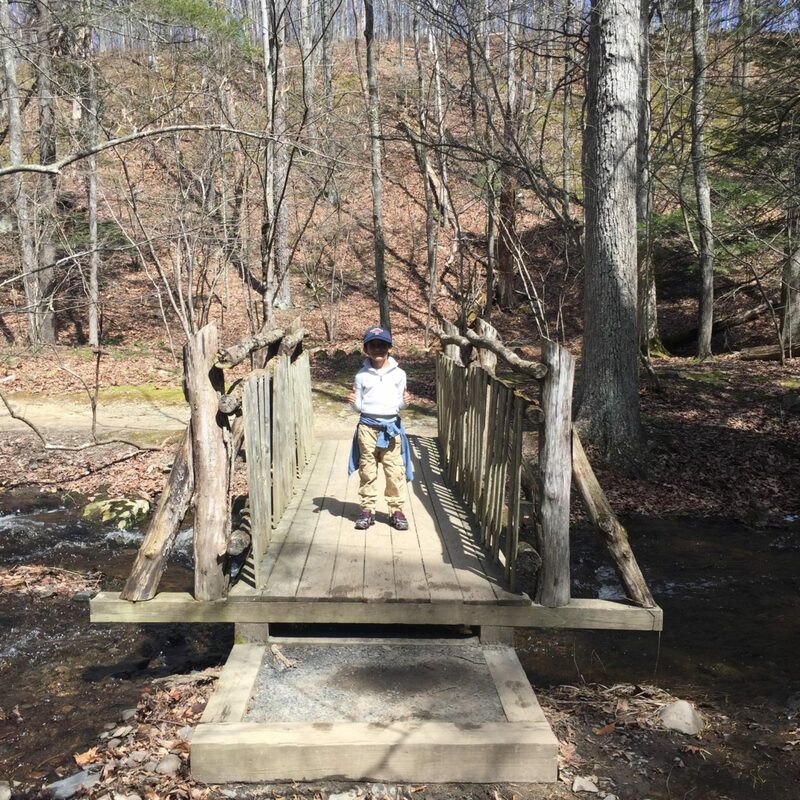 If there is anything us Mom’s know is that we sometimes like to say “better late than never”; and I’m taking that to a whole new level with my posts this week. So much happened in the last few weeks that I want to share with you because they were exciting and definitely worthy of sharing! 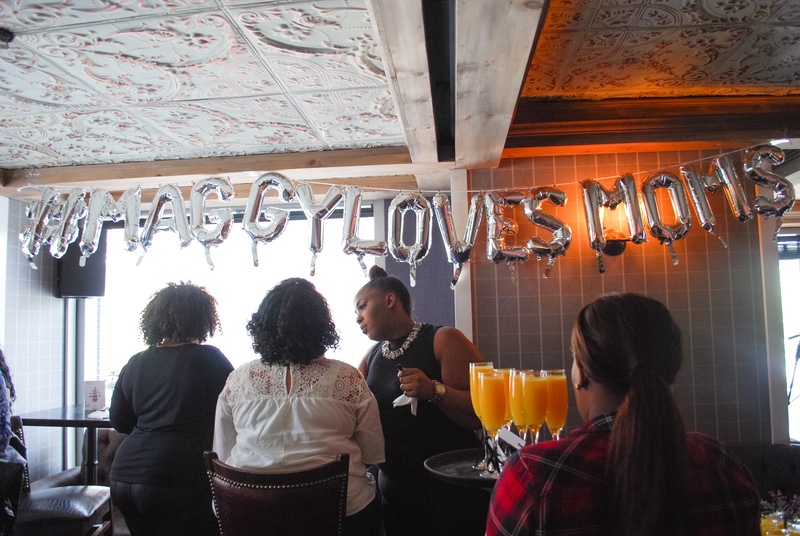 Shortly before Mother’s Day, I was invited by the brand Maggy London to host a special Mom (see post here) to a brunch and a bunch of goodies. What a special event! 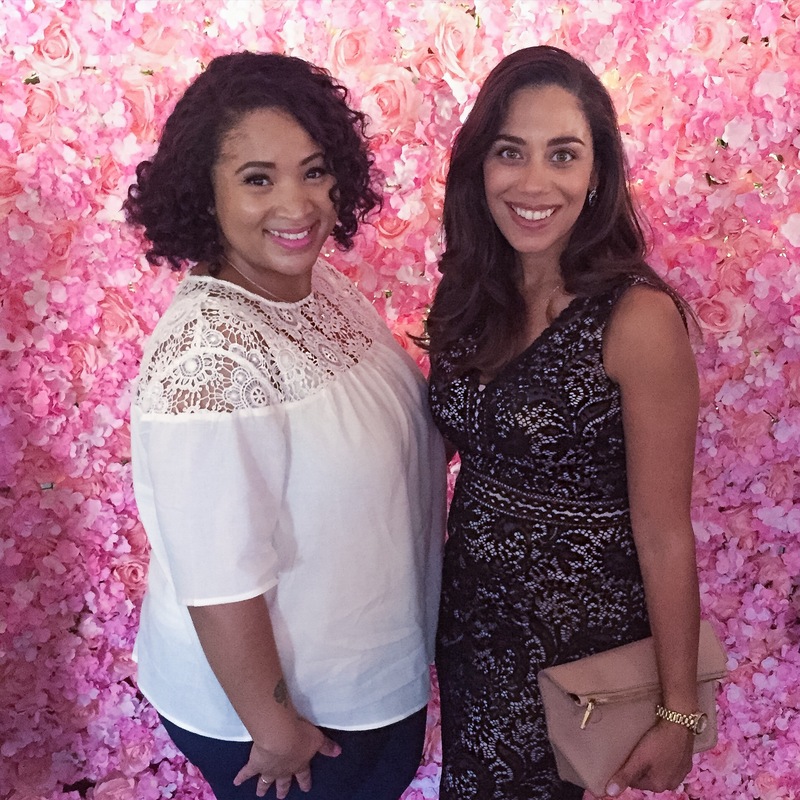 Upon arriving, I immediately met some of the other Mom bloggers who are such stunning and gracious women. 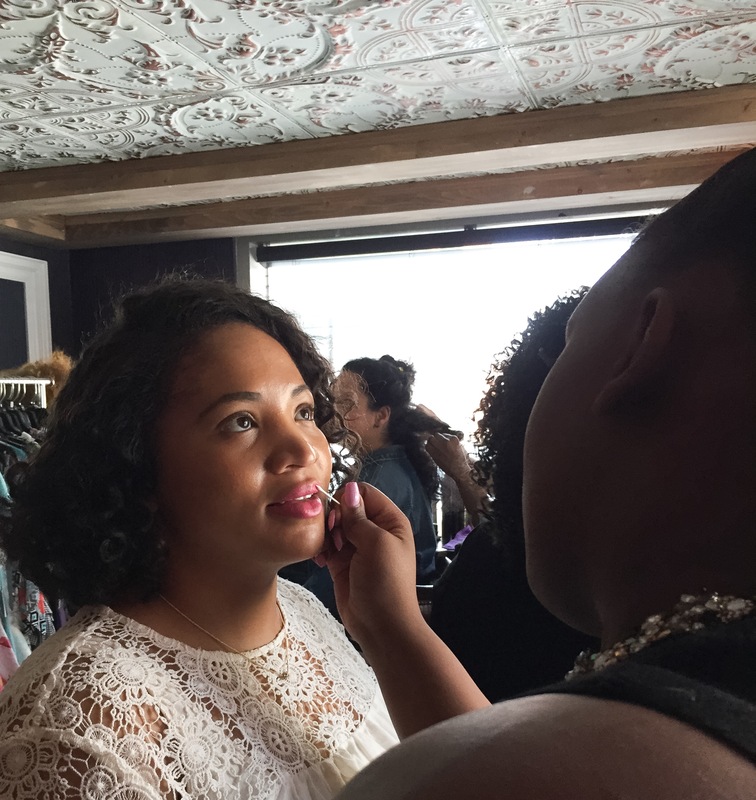 It was an intimate brunch held at The Chester in the Meatpacking District in New York City, and my lucky mom winner Ana got to jump right in and get her makeup and hair touched up to feel more glam than she already was. It was such a joy to spoil her and make her feel as beautiful as she is! (Some photos were on my phone…please excuse the “grainyness”!) She was immediately drawn to this one beautiful dress (their most popular!) from Maggy London and was so thrilled that it was the perfect dress for an upcoming wedding she planned to attend this summer. She also received a pair of shoes from Corso Como, and jewelry from both Gorjana and Dogeared. The table decor and pink floral wall were such lovely touches to make us all feel special. I wore this Maggy London black lace sheath that was so comfortable and elegant. I could easily see myself wearing it again to a wedding or a special evening out with my husband.There’s just something about lace that I love when I want to feel elegant and classic. Some of my current lace favorites are on sale at Nordstrom’s Half Yearly sale and Net-a-Porter (OMG! ), like this halter peplum top, this lace fringed camisole, or this yellow lace Michael Kors dress. I didn’t know about the Maggy London brand previous to this brunch, and I am so glad that I do now because not only are the dresses beautiful,cater to women of every size and easily available at Nordstrom, but also are genuinely kind to their customer base and have a wonderful brand ambassador in Chloe Melas, a Senior Entertainment Reporter for HollywoodLife.com. If you are on FB, you may have seen this fun Facebook Live video (one of firsts!) 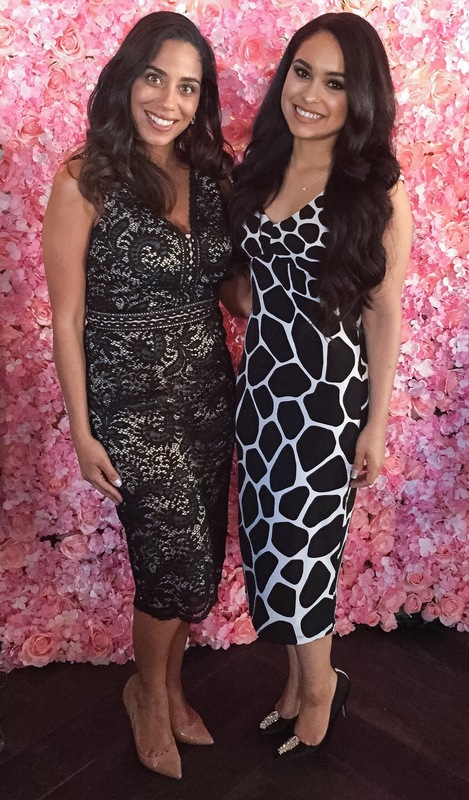 with Chloe and I sharing the beauty of the event. 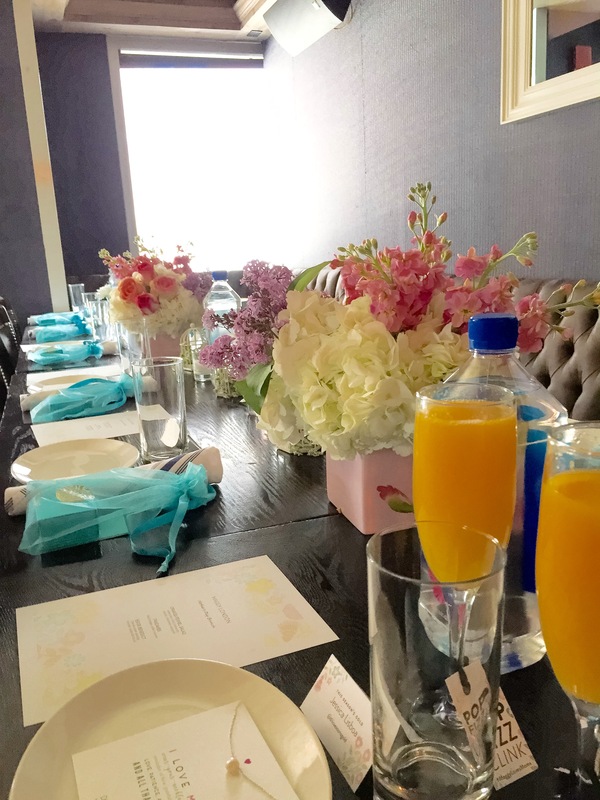 Once our guests arrived, we were excited to sit down and have a roundtable Q&A about balancing motherhood and a career as well as the ever burdening Mom guilt that we all experience at some point in our “being mom” lives! It was such a beautiful exchange with a group of beautiful fashion and mom bloggers that I was so honored to meet. We shared some very wise words about what it really means to “having it all”. 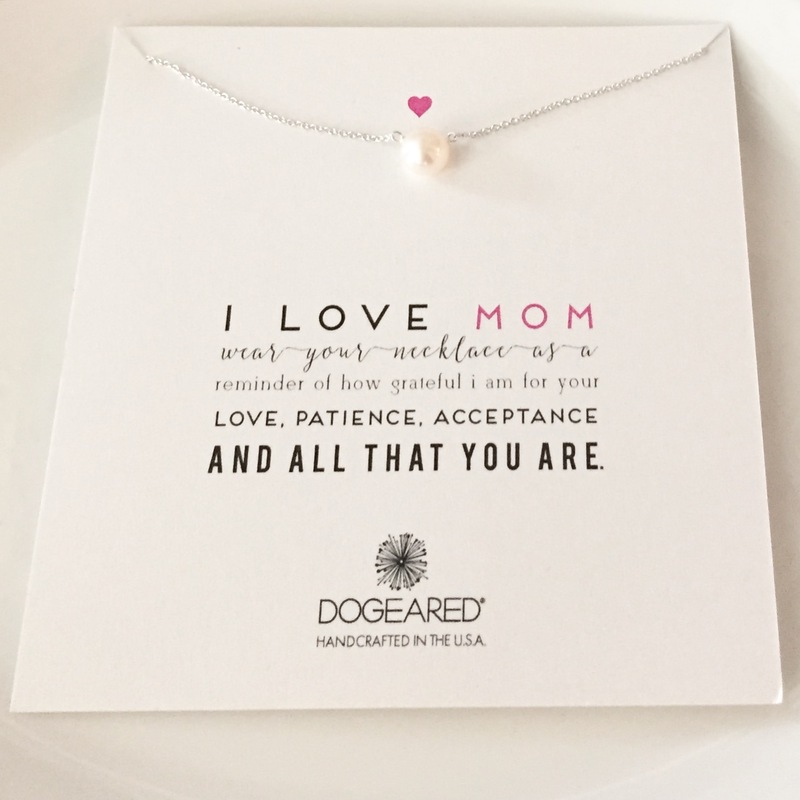 For all my Mom readers out there, you know that it’s not always easy, and in the quietest moments of our lives we sometimes can feel guilt for not doing enough or being enough for our children. We can be hard on ourselves, and I think it is so important to step back and realize that we may not always do the right thing, but our love and dedication to our child(ren) will always be the most important part of our jobs. We need to forgive ourselves, ease the need to be perfect ,and know that in the end even when we make mistakes, all our little ones want is to connect with us and feel us fully present when they are near. My favorite question one of the bloggers asked is one I’d like to pose to you: What do you believe is the perfect way to balance motherhood and a career? I’d love if you would share in the comments below or tweet (find me on twitter here!) me your thoughts! Thank you so much for reading! I have a few projects down the pipeline, and I hope you will follow along as I reveal all of them soon! Don’t want to miss out? Get a sneak peak by signing up for our newsletter right here! They also featured me this week with their Links a la Mode, so I really want to thank them for their support and loyal following of my work! 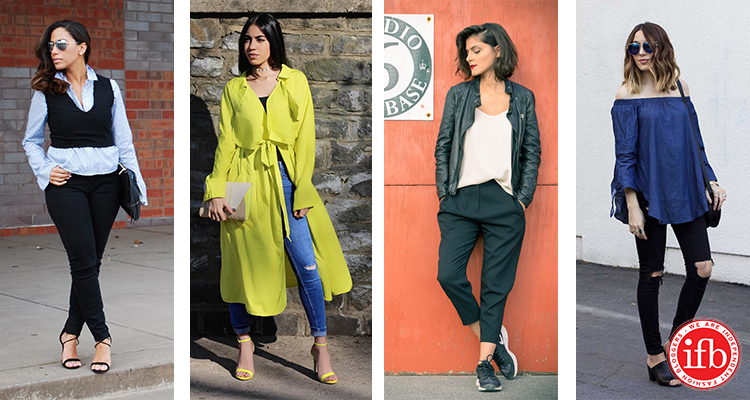 Check out all the blogs featured this week, and my most recent fashion post below! Above all of that, I have recently partnered with my (yes, I’m claiming it!) local J.Crew at The Shops at Riverside in Hackensack, NJ for a Styling Event! This honestly is something I’ve always looked forward to as I have been a loyal client of J.Crew for many, many years. Without knowing it, when I got engaged, Mr. E put the ring on a pair of J.Crew gloves! Part of my obsession with J.Crew also started when I found a what-was-then a small little blog called J.Crew Aficionada. She shared some of the great sales and events that J. Crew was hosting, and it was my first glimspe into something I wanted to do. If you are in my local area, on April 29th anytime between 6-9:30pm, I’d love to meet you and enjoy a night celebrating J.Crew style in the new arrivals! Just be sure to RSVP (a must!) at the link here. My son’s closet is 90% J.Crew, so he can’t wait to find some fun new clothes to wear! He’s my number one J.Crew Crewcuts model, for sure! I look forward to styling and sharing with you! Here are some great current finds at J.Crew that you might enjoy while they are having a sale of $75 off $200 or $25 off of $100 with code SHOPNOW. Thank you for always reading, stopping by and for your loyal support! The Curious Portafoglio: What is a Digital Editorial Assistant? 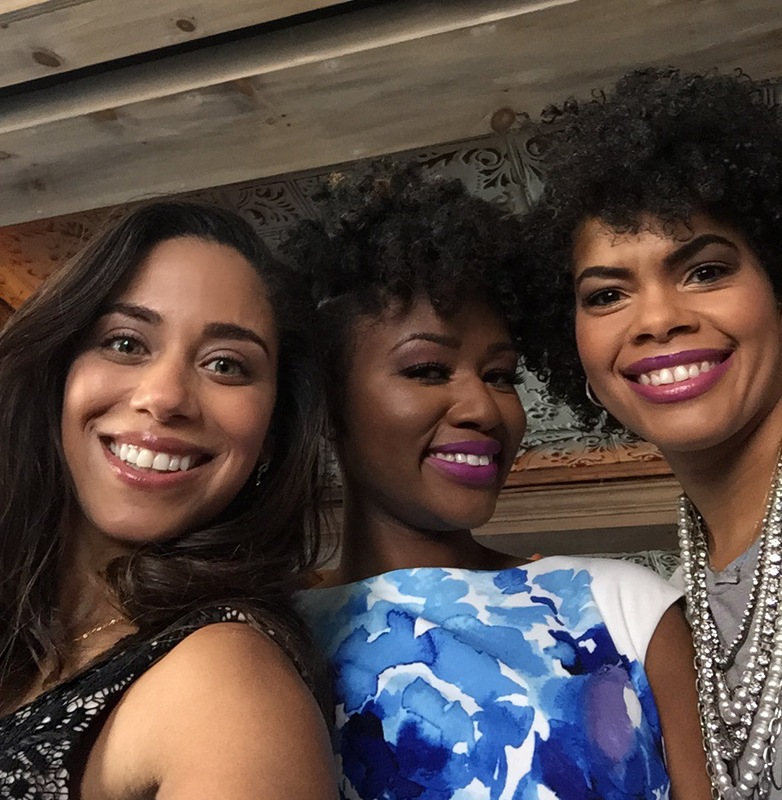 Moxie Beautiful: What Do I Wear to a Fashion Event? 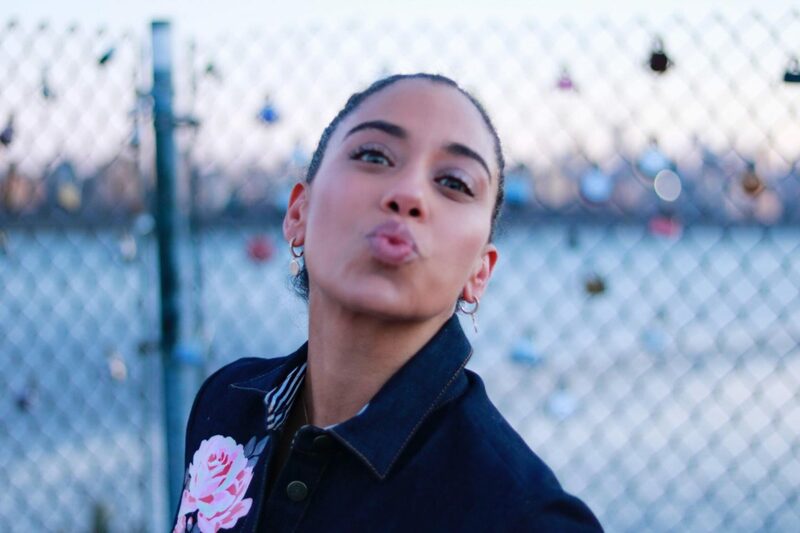 What Erika Wears: Should You Always Have a Plan B?